As the storm clouds gathered over Barcelona this morning, they were an apt metaphor for what was to come. By the end of the day, the gloomy sky was still in evidence, but the violence meted out by the National Police has become the real storm brewing. In football terminology, football being the true lifeblood of this city, this was a game of two halves. I saw a polling station in Barceloneta which remained peaceful through the day. The voters queuing up, were watched by four local police officers (Mossos d’Esquadra) who stood at a distance doing little other than chatting among themselves. The mood was upbeat. Initially there had been some technical issues (these were widespread at polling stations across Barcelona) resulting in the crowd chanting ‘votarem’ (we will vote). However shortly after, the polling station opened and those who were first to vote were greeted by applause and cheers when they exited, having cast their vote. Returning here at various points throughout the day, I didn’t witness any violence and there were no Guardia Civil officers in evidence. Indeed, when a patrol car of the Mossos d’Esquadra passed through the throng, doing nothing to prevent the vote, they crowd applauded the car. This morning I saw another neighbour, Maria, heading out and she said she had absolutely no interest in voting. Whilst she said she always voted normally, she said she would not be voting today as she did not believe in the legitimacy of the vote nor was she pro-Catalan independence. Chatting to a lady who was waiting to vote in Barceloneta, her feeling was that the pro-remain people who had attended a march yesterday, were largely from other areas and not ‘true’ Catalans. And yet, Maria would call herself a ‘true’ Catalan. Such divisions are rife in Catalonia. In the early afternoon there was a march by the pro-remainers, those who favour staying with Spain. They marched through Barcelona, accompanied by the National police. Again, whilst fairly boisterous, singing songs such as ‘Viva España’, I witnessed no violence from them nor the pro-separatist Catalans walking past. 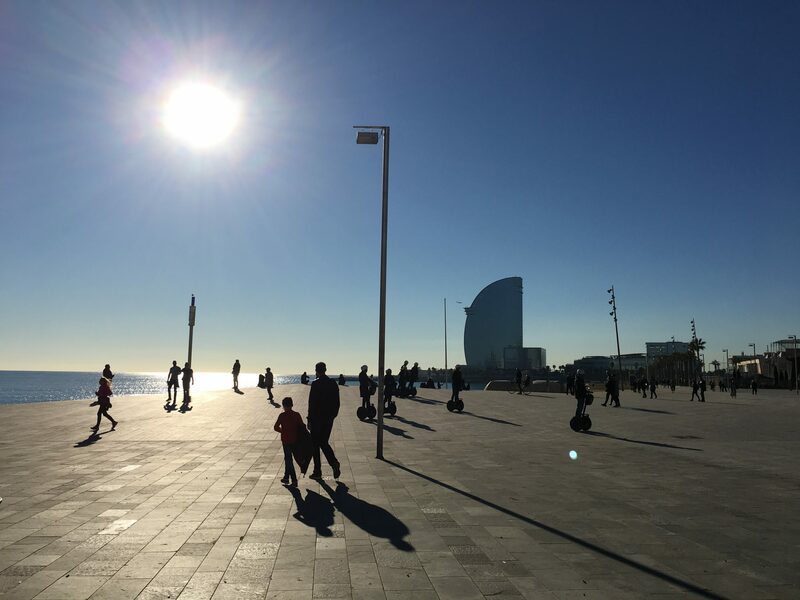 Much of the Born and Barceloneta, two central districts of Barcelona, remained calm and eerily quiet apart from the constant hum of the helicopters overhead; a sound which has become something of Barcelona’s soundtrack in the past month. However, I have subsequently seen numerous pieces of footage on Facebook, posted by friends and others, which show the brutality so many had feared. Unarmed, defenceless citizens thrown down the stairs, dragged out by their hair, jumped upon and kicked by Guardia Civil officers, in full riot gear, and all just for sitting in peaceful protest. Similarly, those protecting schools by forming human walls to protect the polling stations, were attacked savagely with batons, despite the protestors holding their arms up in peace. When the forces of law and order hit and attack defenceless citizens, they lose the general population’s respect and trust. Respect and trust in the police is vital to a well-functioning democracy. It was notable throughout the day that the Mossos were in evidence throughout the city, but did not, as far as I have seen, lay a hand on a protestor, nor respond as the National police did. It is very clear that Spain and Catalonia are divided both from each other and within. This referendum, at the very least, has brought the issue of Catalan independence, to the world’s attention, which was perhaps partly the point. Given how many ballot boxes were seized, how many weren’t able to vote and perhaps, as is the case with my neighbour, a boycott of the vote, it seems unlikely that the Catalan parliament can call for independence from Spain in a few days, as Carles Puigdemont, the Catalan President, had said he would do, were the result to be a ‘sí’. Tonight, FC Barca’s football match is being played behind closed doors, to prevent any outbreak of violence. And to keep up with the football analogy, it feels that even if the ‘sí’ camp ‘wins’, it will feel like a goal which is disallowed by the referee. Given that the referee is perceived as being biased too, it would seem that no side is going to ‘win’. With tempers flaring both on and off the pitch, perhaps all should refrain from playing the game until at the very least, everyone has agreed upon the rules. Next postIs Travelling Just a Tall Tale of The (Roman) Emperor’s New Clothes?